While I tend to wear softer and more neutral hues throughout most of the year, there's no denying that some colors are just more seasonal than others. Cranberry, merlot, marsala, maroon, bordeaux, burgundy -- whatever you choose to call it -- is a gorgeous, rich hue that's perfect for Fall and Winter. It's such a nice contrast to the more muted, earthy neutrals that are so prevalent this time of year, and I love that it adds a bold, beautiful burst of color to any outfit. I find myself incorporating more of it into my wardrobe rotation as the seasons shift and temps begin cooling down. 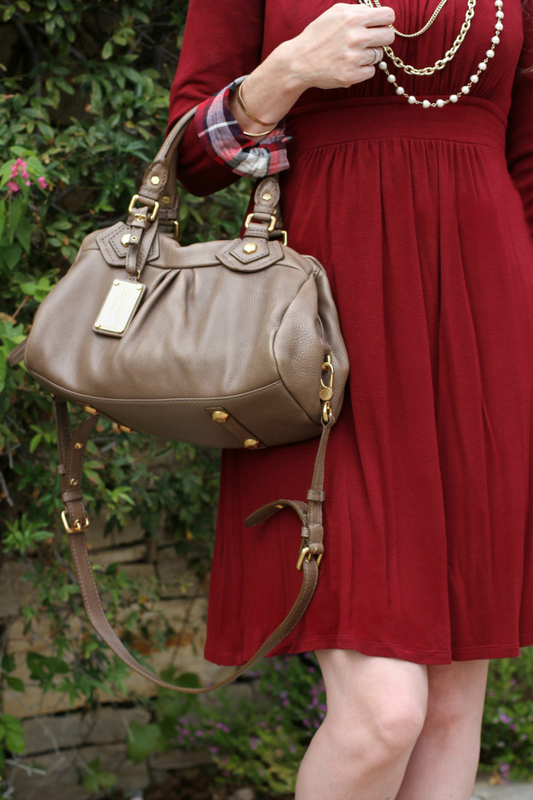 This cranberry swing dress is a fun alternative to my usual day-to-day office looks. Since most of my workweek outfits consist of my beloved classics like shift dresses, pencil skirts and blouses, it's nice to mix things up a bit after-hours or on the weekends. 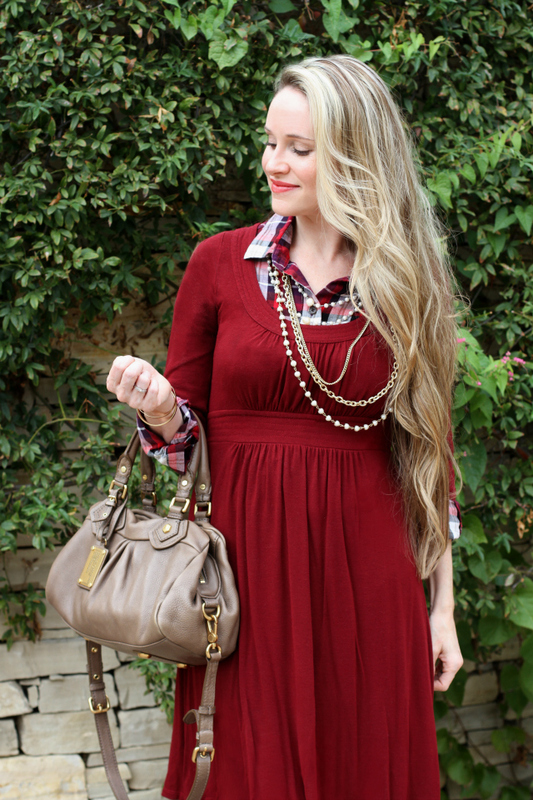 I chose this longtime favorite dress from Anthropologie to layer for a cute and comfy Fall weekend look. It's soft, forgiving, and easy to layer. And of course, the color is everything! Layering a long-sleeved, button-down shirt under a dress is a great way to add texture, dimension, color, and pattern to an outfit while also adding a bit of warmth. 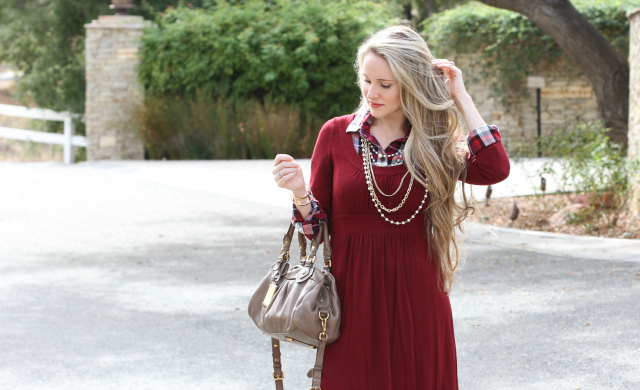 This plaid shirt from Old Navy in shades of burgundy, navy, and white complement the color of the dress nicely. And, of course, plaid goes hand-in-hand with crisp, autumnal weather, don't you think? You really can't go wrong with a classic plaid shirt. As a contrast to the deep color of the dress, I chose earthy taupe accessories with my trusty Marc Jacobs satchel (which also doubles as a crossbody) and Vince Camuto Franell suede booties. The earthy taupe shade plays well off the cranberry/burgundy, and serves as a great neutral year-round. If you're on the hunt for a similar taupe satchel, Marc Jacobs released a cute option here. I also found a couple of less expensive options here and here that are great alternatives. These suede booties are quite popular among bloggers, and for good reason: they're super soft and comfy, high-quality, and have a sturdy block heel that makes them easy to walk in. The dip in the front also works well for us petite ladies, helping to elongate the legs -- yesss! I don't wear booties often, and am pretty picky when it comes to the shape, fit, and color, but I love these and highly recommend them. To finish the look, I added one of my favorite multi-layered pearl necklaces from Ann Taylor and a simple pair of pearl stud earrings. Pearls dress up any look and are such a lovely, feminine detail. What are some of your seasonal wardrobe favorites? Thanks so much for stopping by, and I hope you have a wonderful day!